Located at the same latitude as some parts of Russia, Hokkaido receives up to 191 inches of snow annually. Temperature in the winter could drop well below -10°C/14°F. 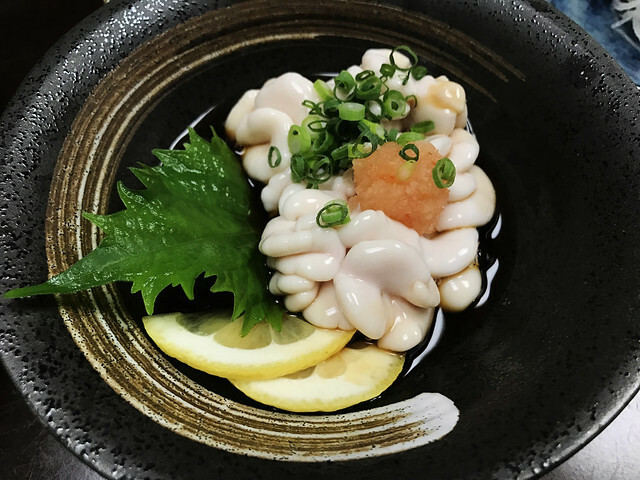 Hokkaido’s climate and close proximity to the ocean gave birth to such culinary wonders. 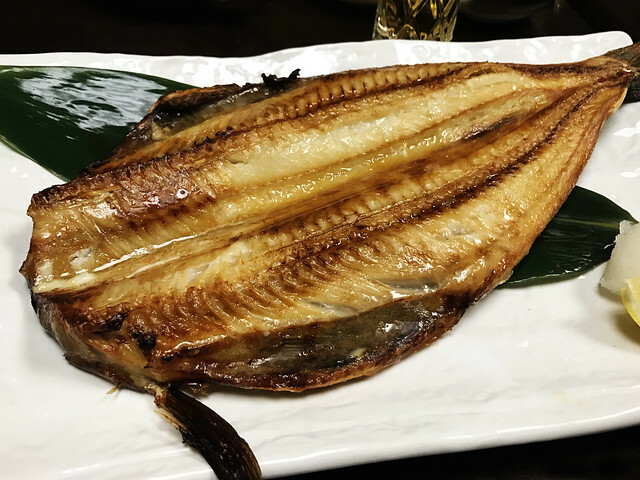 There are plenty of seafood, but it is different from Tokyo’s staples because of the extremely low water temperature. 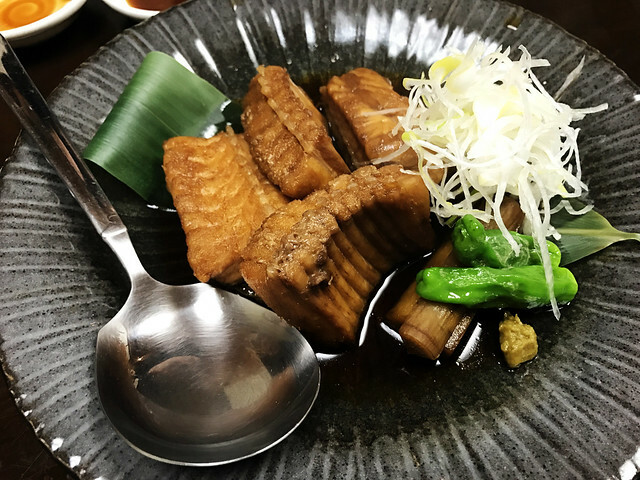 In addition to that, locals also eat seals, whales, bears and horse sashimi…our beloved beef and chicken are swept to the sidelines. At first glance, it looked like tiny, glazed beef ribs. It couldn’t taste more different. Biting into the meat, one would encounter the crunchy and chewy cartilage of the manta ray’s spine. The initial sensation was disturbing but once we got used to it, the flavors were a complex, wonderful mix of salty, sweet, rich and chunky. Do not be alarmed by the brain-like appearance and viscosity. We didn’t expect to like it but we must try it, both out of appreciation for our host and because we were curious (who wouldn’t be? We didn’t even know what fish sperm looked like). The Tsubu shell was the fanciest portion of our meal. 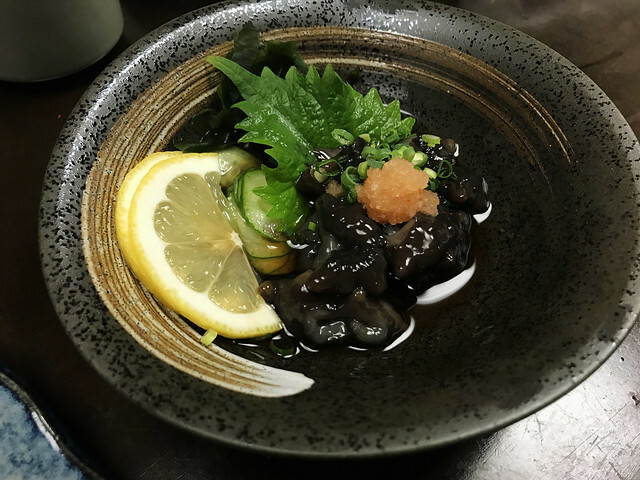 Hokkaido is home to various sea snails…this particular kind has a chewy texture, a touch of sweetness and a refreshing scent of the sea. 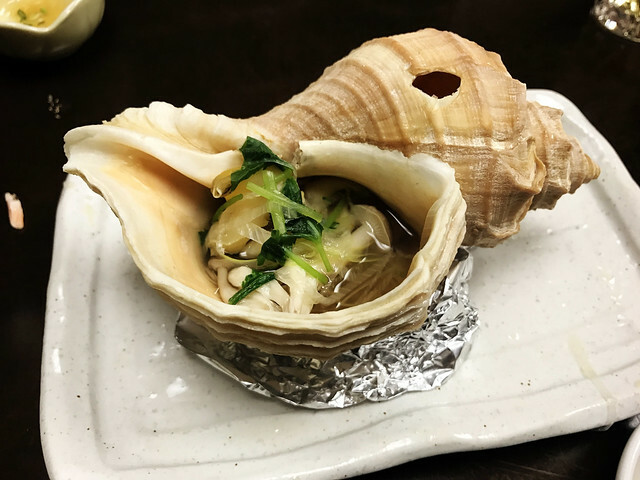 The shell is served fresh with just a dab of lemon juice and Japanese daikon radish on the side. We ate it raw, so there was that distinct salty taste of fresh seafood. It was light and chewy, perfect for snacking in-between heavier dishes. We always thought that horse meat would be hard, but they served the part of the neck that was softest. The meat melted in our tongues and was gone so fast, we didn’t have time to snap a picture! 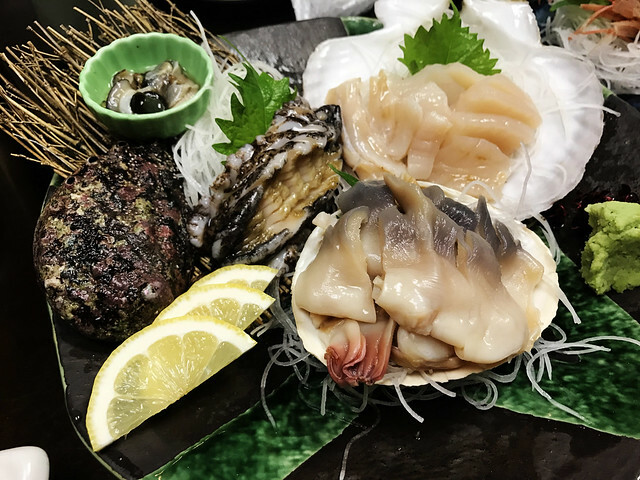 We also had sea urchins, hokke fish, squid, crabs, oysters, yakiniku. At the end of the night we were full and, to be honest, a little surprised at our adventurous eating. And the Sapporo Classic beer, sold only in Hokkaido, that we tried that day…by all that is good in the world, it was the sweetest we’ve ever tasted! Warm food (i.e. : ramen) was comforting and delightful, especially after a harrowing day out in the cold. 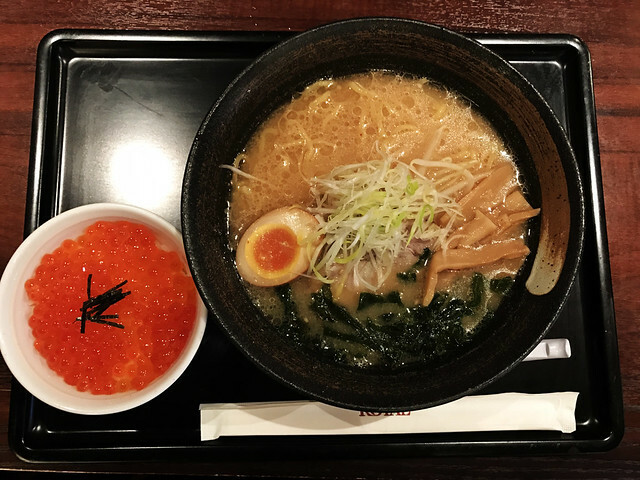 Hokkaido’s Ramen is either miso-based or soy sauce-based with various levels of spiciness. On top of the ramen noodles, you can expect some slices of pork, tender bamboo shoots, chopped vegetables and a soft-boiled egg that drip its gooey center all over the bowl. 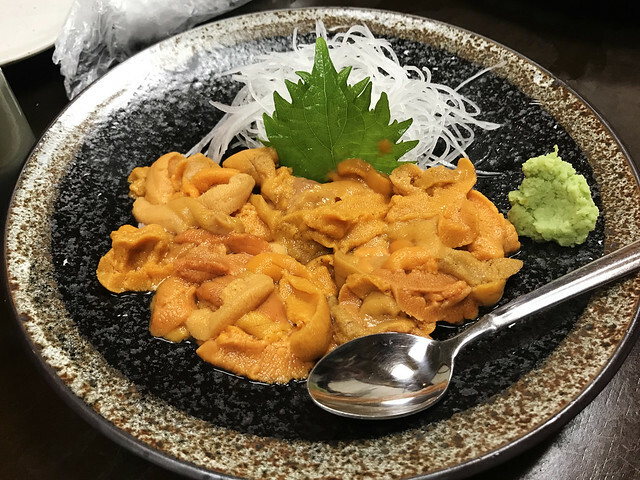 Sometimes you’ll have a bowl of juicy ikura on the side. Yum! 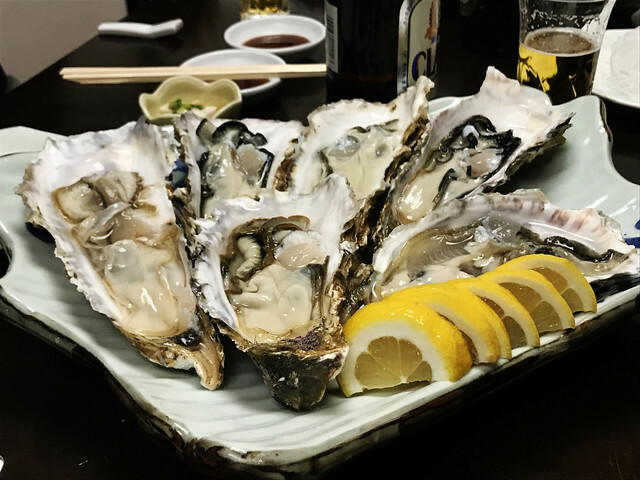 When you are in Hokkaido, make sure to explore the food they offer. 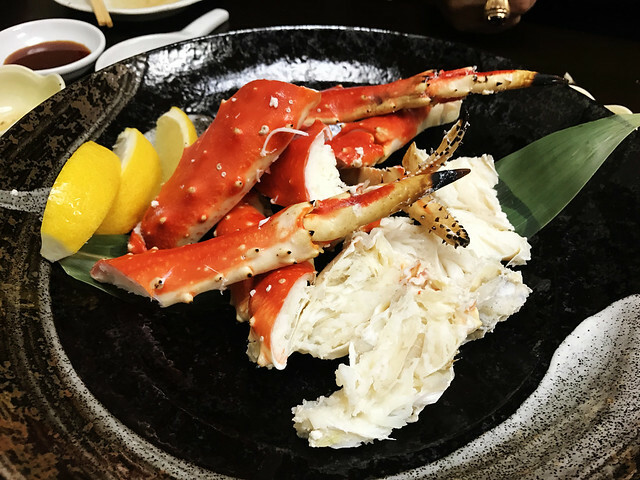 Maybe you’ll be hesitant, but to that we say: don’t worry, we were too…but if you didn’t take that first bite, you would never know the wonders of Hokkaido’s cuisine. This entry was posted in Food and tagged culture, eating raw in japan, exotic food, fish sperm, food, hokkaido, hokkaido cuisine, hokkaido food, horse sashimi, is it safe to eat horse sashimi, japanese food, mypassengerdiaries, on budget travel, photography, raw horse meat, shirako, student travel, tourism, travel, traveling, tsubu shell, wanderlust. Bookmark the permalink. 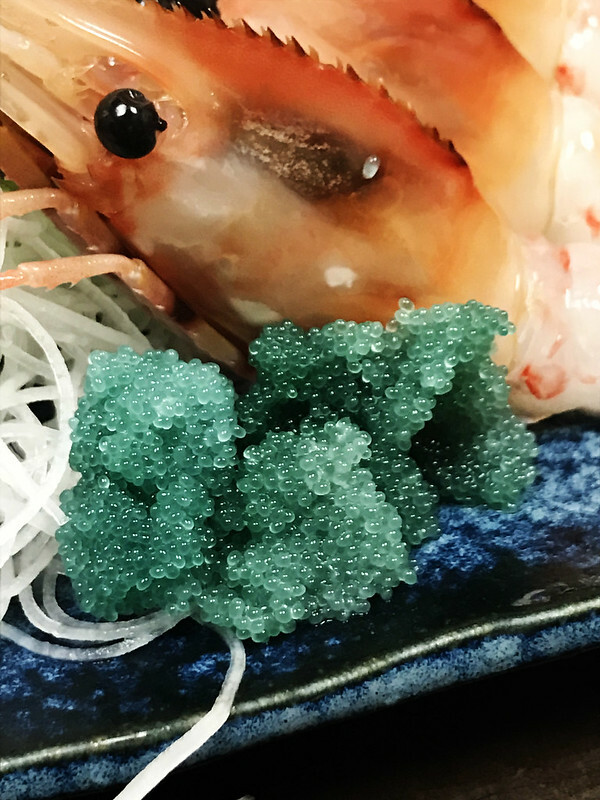 I am not a seafood fan.But I must admit your photos are of such tantalizing quality that I might be tempted to try some of these fabulous dishes except for the fish sperm dish. Very adventurous dining!! 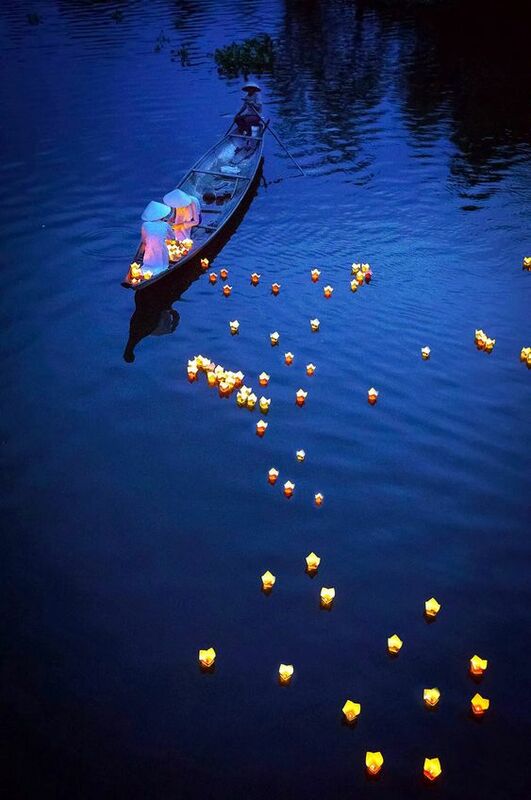 Impressive photos. Thanks for sharing, I enjoyed your post. Congratulations on your adventurous eating! However, I have no wish to emulate you….